Trends and Determinants of Cycling in the Washington, DC Region by Ralph Buehler with Andrea Hamre, Dan Sonenklar, and Paul Goger was just published. 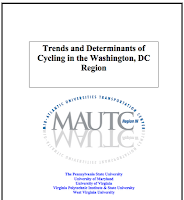 This report analyzes cycling trends, policies, and commuting in the Washington, DC area. The analysis is divided into two parts. Part 1 focuses on cycling trends and policies in Washington (DC), Alexandria (VA), Arlington County (VA), Fairfax County (VA), Montgomery County (MD), and Prince George’s County (MD) during the last two decades. The goal is to gain a better understanding of variability and determinants of cycling within one metropolitan area. Part 2 of the report presents a multiple regression analysis of determinants of bike commuting based on data of 5,091 workers from the Washington, DC region. A series of logit, probit, and relogit (Rare Events Logistic) regressions focus on the role of bike parking, cyclist showers, and free car parking at work as determinants of the decision to cycle to work, while controlling for socio-economic factors, population density, trip distance, bikeway supply, and season of the year. The report finds that cycling levels and cyclist safety have been increasing in the Washington region. However, cycling appears to be spatially concentrated in neighborhoods of the urban core jurisdictions. Compared to national averages for urbanized areas a larger share of bicycle trips in Washington, DC is commute or work related (41% vs. 17%). Area cyclists are predominantly male, between 25 and 40 years old, white, and from higher income groups. Fairfax is at the bottom in most categories such as the percent of car-free households (4%) and the smallest percentage increase in bike commuting from 1990-2005. We led in cyclist fatality rates which were 2 to 4 times greater in Fairfax and Prince George’s County. On the positive side we had the most miles of paved off-street trails. There's lots of great information in the report that I'm sure FABB will be using as we make our case for Fairfax becoming more bike-friendly.